Recorded on January 18, 2016. 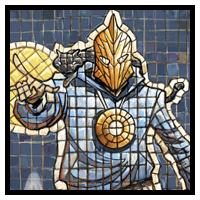 Egyptian-American Brooklynite Khalid “Kent” Nassor stumbles upon the helmet of Fate, which transforms him into the all-new Doctor Fate! An overwhelmed Kent finds himself tackling a strange set of magical powers, all without an instruction manual. But he’ll need to master his new tricks fast, as Anubis, the Egyptian Lord of the Dead, is preparing the flood to wash the world away.